The Miami Marlins are back in teal! And 25 years later New York Yankees great Derek Jeter is the new Chief Executive Officer. The baseball team is bringing back it’s original trademark color, back into its design scheme for 2018 as part of a season-long celebration of the 25th anniversary of its first season. The storylines from the inaugural year to this present moment cannot even be written out of a book. Or even predicted. Jeter is far from playing for the team this coming season. He announced his retirement as a player in 2014. When Jeter turned 40 years old that summer, his number 2 Yankees jersey was not only still the top-selling jersey that season but also the most popular of all-time (his “final season” tour contributed). The new CEO has thrown off the “popular guy” baseball cap and has made very unpopular decisions for a team who 25 years later needed a complete overhaul. Jeter has been blamed for firing Marlins assistants, a scout who was in the hospital undergoing treatment for cancer and the team’s play-by-play broadcaster. Miami-Dade County is suing the Jeffrey Loria ownership group (the last owners) and the Marlins franchise to recover profit sharing, which is going to be a separate storyline to follow during this team’s 25th year in the MLB. Moreover, Jeter’s name has been smeared after not even a quarter of the year of him partially owning the team. Unpopular decisions are one thing but plans to get this MLB franchise out of the hole financially it is presently in can have Jeter’s ex-boss the late George Steinbrenner rolling in his grave. I read Tom Verducci column in Sports Illustrated titled “The Captain is the Boss,” learning Jeter is connected to bonus provisions tied to cutting payroll that can earn his investment back; for fronting an ownership group that needs money. Then the obvious of the plan for boosting attendance after trading his best players. The appearance of missing the winter meetings to attend a Miami Dolphins Monday night football game was not helping his case for the honeymoon being steaming. Jeter flat out denied bonus claims and more even though there is paperwork to back it up, again all of this bacilli happening the first three months behind the desk. Jeter is not running out of the dugout for Marlins and they a far from being the New York Yankees. Marlins have not made the playoffs in 14 seasons and have had eight straight losing seasons. The has $400 million in debt on its books. Pitchers and catchers report to Jupiter this week for Marlin’s spring training. The show must go on. 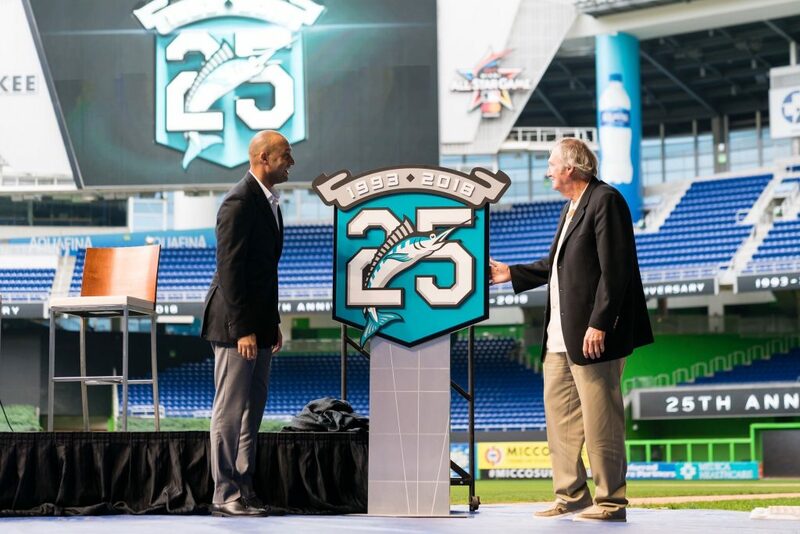 The Marlins will wear a specially designed patch that was unveiled at Marlins Park during an event with season ticket holders, on their uniforms for every game. The team will also wear throwback teal uniforms during the June 8-10 home series against the San Diego Padres. Jeter picked one of the worst farm systems in the MLB. The Marlins has finished last in the NL attendance in 12 of the last 13 seasons. It has lost more than $600,000 paid customers since Marlins Park opened in 2012. The Marlins are missing 116 of their home runs from last season. The back then “Florida Marlins went 64-98 their inaugural season. The throwback uniforms pinstriped with a teal “Marlins” across the chest-will be just like the ones the Marlins wore from 1993 until 2011. They changed their uniforms and color scheme (and name, from Florida Marlins to Miami Marlins) with a rebrand ahead of moving into Marlins Park for the 2012 season. “I’ve told my players every year that I have managed. I’ve never been in a game that I have expected to lose,” Mattingly stated. The cost to purchase this team came at a price tag of $1.2 billion, with Bruce Sherman covering the majority of it. Las Vegas oddsmakers have the Marlins winning 65 games this season.